Atlas Master Series GP38: Easiest Decoder Install Yet – Comes Built-In! Just remove the dynamic brake section on the top of the engine to expose the decoder. The engine is delivered set for analog (conventional DC) operation. Move the jumper plug over to configure for DCC operation. The decoder’s address is factory preconfigured to the last two digits of the engine’s number (undecorated or unnumbered units are set to address 03). 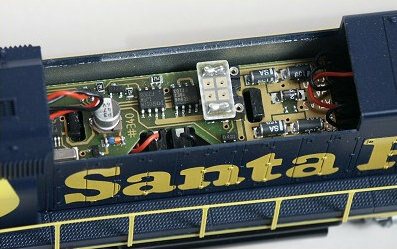 Atlas Master Series GP38 with built-in DCC decoder. Any of the other Atlas lightboard form factor decoders would also fit as a replacement in this engine.